and inside those rings are often dark spots - see picture above to the left. can go up to 180 kilos, but usually somewhere between 70 and 135 kilos. and apes, and once in a while also fruit. for dinner coming along. Then it hits it hard with his foot, and then having a nice meal on shore. have been moving in. Then it comes to know domestic animals, and becomes a threat to them. Jaguaren is an excellent climber - and in addition also an eminent swimmer, and therefore the Amazon wetland gives it a place where it can move around without difficulties. There also excist black jaguars, and they are often found in dense forests and are called black panthers. Ung han- jaguar krysser en elv, angriper en caiman i vannet og spiser den. 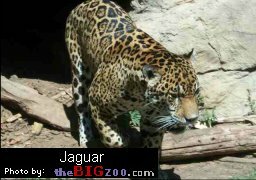 Usually a Jaguar is yellow with black spots. (see picture above), but sometiomes it happens to be completely black. Then it is almost like the panther. Do you know the difference between a jaguar and a panther? The panther - or leopard as it is also called, in Africa and Asia. The jaguaren is the heaviest with its 150 kilos against 90kilos. A black panther is a large black cat. Black panthers are melanistic colour variants of several species of larger cat. 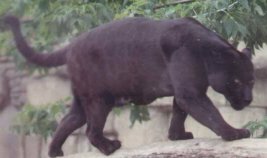 Wild black panthers in Latin America are black jaguars (Panthera onca), in Asia and Africa black leopards (Panthera pardus). Jaguaren was once the Mayas and Atzekes most holy animal. To day it is almost extinct owing to souvenir-hunting, and also because it has learned to live on pigs and calfs from agricultual establishments. 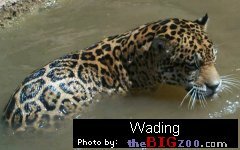 The jaguar is both climbing and swimming well, and often take living animals both in rivers and lakes.